Praised for ‘playing of compelling conviction’ (The Daily Telegraph) and ‘full of sparkling detail, with tonal beauty and incisive rhythmic clarity, balancing wit and poetry’ (The Strad), Michael Foyle's current season includes concerto debuts with the Rotterdam Philharmonic Orchestra, English Chamber Orchestra and Polish Baltic Philharmonic Orchestra. In Autumn 2018, his 'World War One Centenary Sonatas' on Challenge Records International was described as 'remarkable' (BBC Music Magazine) and 'a dream debut' (Luister Magazine). In 2019 he will issue 'Complete Violin and Piano Works of Lutoslawski and Penderecki' on Delphian Records with pianist Maksim Stsura. In recent seasons, Michael has made recital debuts in Wigmore Hall, Southbank Centre, St. Martin-in-the-Fields, Bridgewater Hall, Usher Hall, Buckingham Palace and St. Magnus International Festival. Abroad, he has made solo appearances in International House of Music (Moscow), The Concertgebouw (Amsterdam), New York Chamber Music Festival, Cervantino Festival (Mexico) and Evgeny Mravinsky Festival (St. Petersburg). Michael is regularly invited as Guest-Leader of BBC Symphony Orchestra, Halle Orchestra and London Conchord Ensemble. 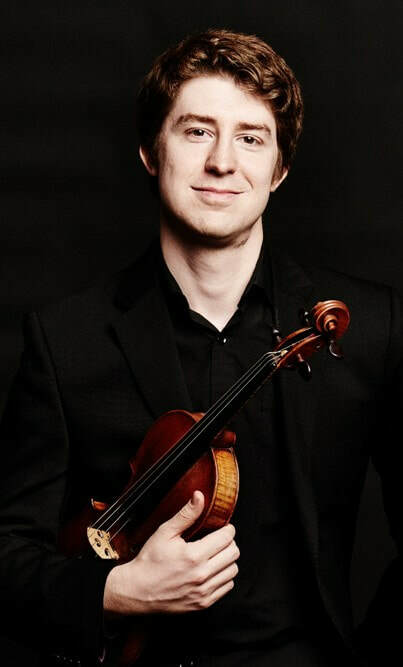 He is also Violin Professor at the Royal Academy of Music, where he was elected Associate in May 2018, and is a City Music Foundation ambassador. Michael plays a Gennaro Gagliano violin (1750) on loan and is represented by Interartists Amsterdam.